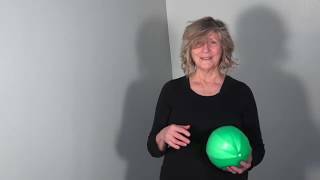 Liz Koch, author of The Psoas Book and Core Awareness: Enhancing Yoga, Pilates, Exercise, and Dance explains and demonstrates 3 simple exploration for softening and hydrating connective tissue using 3 different size balls. Psoas, as fluid tissue, benefits from working with hydrating techniques that increase our sense of buoyancy. Liz introduces each ball for increasing sensing how bones float, experiencing ground reaction force, and dynamically moving diaphragms. See Core Awareness; Enhancing Yoga, Pilates, Exercise & Dance for Liz Koch for more ideas and approaches that nourish psoas, increase proprioception, and hydrate connective tissue.As the messenger of the midline, the Psoas expresses our survival/fear responses and our desire to thrive and innovate. Unfortunately, typical habits such as shoes, sitting in poorly designed chairs for extensive periods of time contributes to not only a loss of vitality and a lack of proprioceptive awareness along the spine but also a lack of resiliency in our fluid connective tissue. Playing with the rebound of balls offers our tissue a joyful way of waking back up and feel how life supports our every move.